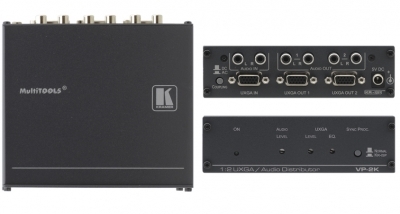 INPUTS: Video: 1 UXGA on a 15-pin HD (F) connector; Audio: 1 audio stereo on RCA connectors. OUTPUTS: Video: 2 UXGA on 15-pin HD (F) connectors; Audio: 2 audio stereo on RCA connectors. MAX. OUTPUT LEVEL: Video: 2.2Vpp; Audio: 6.8Vpp. BANDWIDTH (–3dB): Video: 380MHz; Audio: >100kHz. S/N RATIO: Video: 73dB; Audio: 89dB. CONTROLS: UXGA: Level: –1.1dB to 6.5dB; EQ. : 0dB to 5.3dB@50MHz; Audio Level: –50dB to 6.2dB; ID BIT switch; coupling switches; sync processing (normal or Kr-isp®). COUPLING: Video: DC/AC selectable; Audio: input AC; output DC. AUDIO THD + NOISE: 0.064%. POWER SOURCE: 5V DC, 138mA. DIMENSIONS: 16.2cm x 10.7cm x 4.4cm (6.4” x 4.2” x 1.7”) W, D, H.